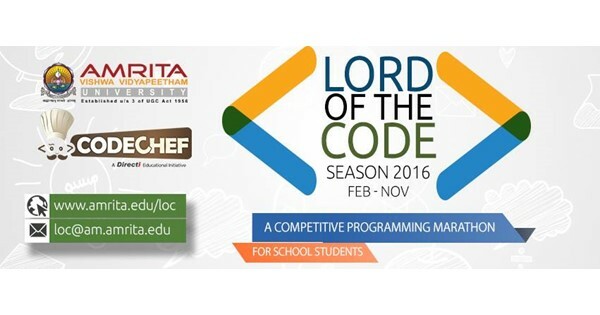 The LoC Competitive Programming Marathon is targeted at Indian school students to improve their programming and competitive programming skills. The Marathon is scheduled to start in the month of February 2016 through November 2016 and dates of the contest in the respective months is mentioned in the link here. At the end of the marathon (in December 2016) a fully sponsored residential programming camp will be conducted by Amrita University at their Amritapuri Campus for the champions selected from this marathon contest. The winners will be honoured as a tribute to the top notch programmer from India – Harsha Suryanarayana (Lord Harsha). Organizer: The contest is hosted by Amrita University in association with CodeChef. Prizes: Know more details here. End time: 5th September 2016, 23:59 hrs IST. Please go through this link to know the eligibility criteria. Also, all the participants are expected to abide to CodeChef Code Of Conduct. 01/09/2016, 23:57 hrs IST: Only two problems will be added at the start of the contest. Rest of the problems will be added as we progress into the contest. Regret the inconvenience caused. 02/09/2016, 11:07 hrs IST: Problem MINMO has been added to the contest.